A good terrine can be one of the greatest pleasures of the kitchen, both in the making and the eating. It may take a bit of time to prepare, but it lasts well too; if you don’t eat it all in the first sitting, it is a welcome dish to discover in the fridge; an instant and satisfying lunch. It also makes an impressive and hassle free starter if you’re entertaining. I love the process of putting all the parts together; it something you can really build, both in terms of structure and flavour. The spices and herbs in the marinade bring out the best characteristics of the game that is kept succulent by the flavourful forcemeat. I was inspired to make this after a trip to my local farmer’s market, where I saw a bounteous display of Autumn game for sale; although any good butcher would be able to provide the same for you. For the marinade of the game, I used some Spiced English Vermouth from a microdistillery in Gloucestershire. It’s certainly not necessary to track it down, but the idea is you could experiment with different alcohol to compliment the game as you fancy (but red wine always works well). 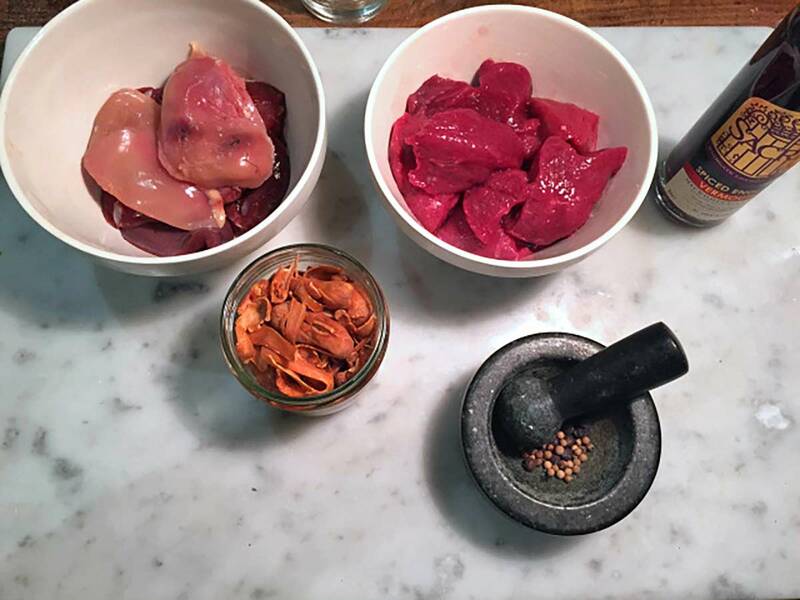 Put the partridge (and/or pigeon) breasts in a small bowl and a put the venison pieces in another small bowl. Divide the thyme, juniper, mace and pepper equally and add half to each bowl, then pour the wine over each. Leave to marinate over night, or for up to 24hrs. In a frying pan, melt most of the butter and gently fry the onion and garlic with a large pinch of salt, for about 5minutes or until the onion begins to soften but not colour. Remove to a large bowl. Add the rest of the butter to the frying pan, turn up the heat and add the chicken livers. Fry briskly, stirring the livers so they colour all over. Pour in the brandy and let it bubble and reduce. Chop the livers finely and add to the bowl with the onions. Add the rest of the forcemeat ingredients and plenty of salt and freshly ground black pepper (remember you will be eating this cold so it needs to be highly seasoned). If you’re not sure how to judge this, you can take a teaspoonful of mixture and fry it until cooked then taste it, adjusting as necessary. Find a roasting tray that the terrine mould fits into comfortably, with room around the sides, and lay a tea towel on the base (this will prevent the bottom of the terrine from getting too hot). 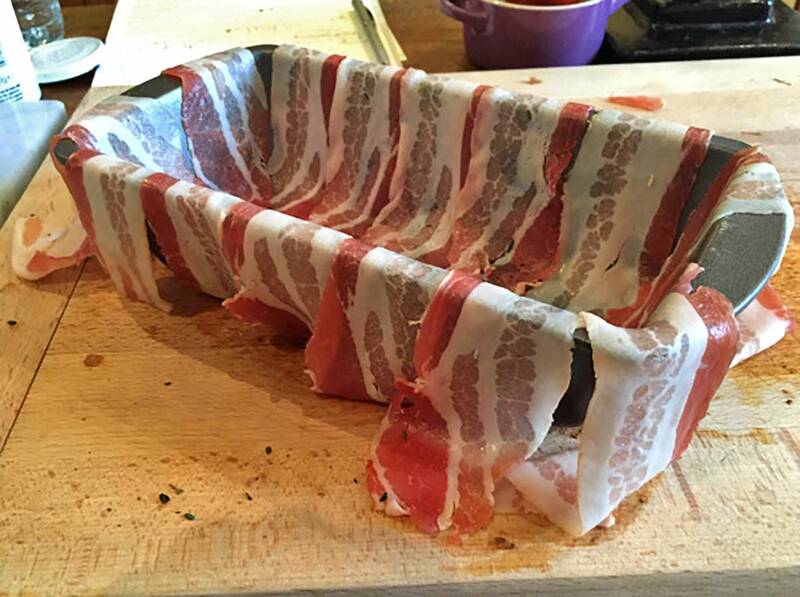 Line the terrine mould or cake tin with the bacon slices so they cover the base and sides but hang over the edges. Remove the breasts and venison pieces onto some kitchen towel and brush off any large pieces of spice. Put a layer of forcemeat in the terrine mould, followed by two breasts laid in the middle and the venison on either side. Repeat this until all the game is inside, and finish with a layer of forcemeat. Wrap the bacon slices over the top to cover the terrine and place two bay leaves over the bacon to finish (the flavour of the leaves will seep into the terrine as it cooks). Finally cover tightly in foil. Place the filled terrine on to the tea towel in the roasting tray and pour hot water (from the kettle) around the sides of the terrine in the tray, so it is ¾ deep in water. Place carefully in the oven and cook for 2hrs. Remove the terrine and carefully peel off the foil, the meat will have shrunk slightly and the juices will be clear. Set on a rack to cool completely before turning out and slicing. Serve with hot buttered toast, cornichons and a green salad.